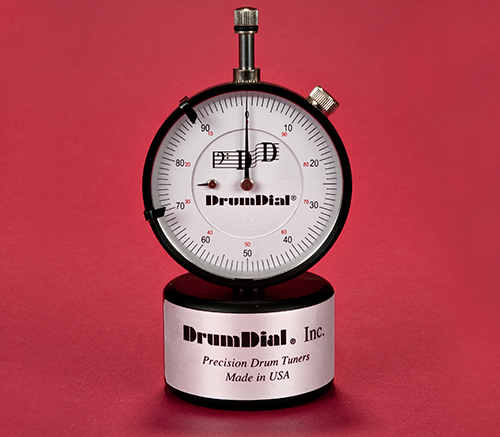 We are now stocking Drum Dials in both the Analog and Digital Versions. During my career, I have used/tried different tools to make life easier from rolling carts, to drum racks, to different de-tuning devices etc. 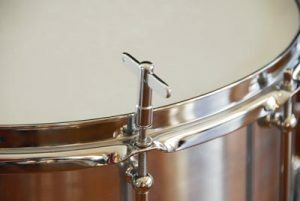 But a must-have device, in my opinion, is a tool that effectively reads the head tension at each tension rod, assuring me that each area is in pitch with all the others and that the head is in tune with itself. For that purpose, I use a Drum Dial, a great tool-when I want to check tuning, or install a new head in a quiet environment-IE don’t hit the drum before the gig in a quiet area. I manually determine my optimal pitch for each of my drums (trying different combinations of top and bottom head tensions). 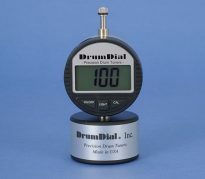 I use the Drum Dial against the head at each rod to quantify that pitch into a reading. I can refer to that reading when re-checking the tuning or installing a new head. Tip: write that reading on the head along with the date of installation. PS: I’m not a tune to a specific note guy. But more of a “my sound consistently” guy! But if you are, see the DD website http://www.drumdial.com/to see how accurately it will tune to a specific note. Another quality product that I highly recommend!